Todd McIntosh was born in Midcoast Maine where he became involved in woodworking as a child. After attending the University of Maine, majoring in Industrial Arts Education, he became a PGA Golf professional working at and running golf programs throughout New England. He then settled in New Gloucester where he designed and built kitchens, built-in cabinetry, and staircases for several years. In 2002, he founded what is now McIntosh & Company Cabinetmakers, located in an historic textile mill in downtown Lewiston, ME. Todd’s responsibilities in the business include marketing, sales, and design. 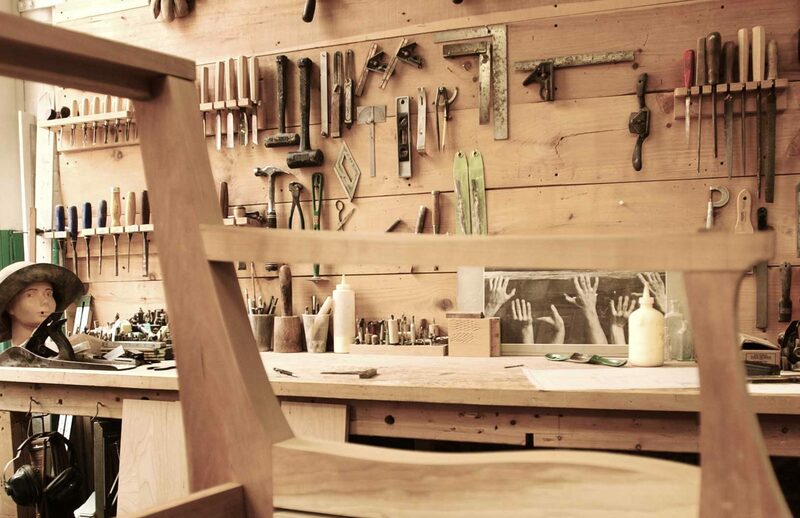 The primary influences of his work are derived from and inspired by the Shakers and the Japanese–clean crisp lines, gentle curves, traditional joinery, and beautiful woods all categorize his work and design. In his spare time, Todd can usually be found somewhere in Casco Bay, rowing or motoring around. He has 2 grown sons, Cameron and Taylor. He lives in Cumberland, Maine, with his wife, Sue Cohen, their daughter, Ella, dog, Stella, and Lucy the cat. Born and raised in the Boston area, Erik Flanagan developed a strong connection to Maine during his high school years while attending Bethel, Maine’s Gould Academy. A graduate of the University of Vermont with a degree in Sociology and Environmental Chemistry, Erik garnered an appreciation and enthusiasm for woodworking and construction during his college years while working for a reputable designer and builder in the area. Upon graduation, he and his now wife, Molly, lived in Thailand where, after teaching English for a year, Erik was recruited to oversee the intricate teak woodwork of a large-scale luxury villa development. Upon returning to Maine in 2008 with a growing passion for fine woodworking, he began a string of personal projects, ultimately leading him to begin with McIntosh and Company as a cabinetmaker. Over his years with the company he has worked in every aspect of custom cabinetry and has transitioned into the art of project management, drafting, and design. Erik’s attention to detail, fervor for all things hand built, and pride in his work is apparent in every project that McIntosh and Company constructs. Create a legacy of beauty and function in your home with custom cabinetry from McIntosh & Company.